This troubling situation is unlike any the world has faced before. The challenge is not simply to deal with a temporary rise in grain prices, as in the past, but rather to quickly alter those trends whose cumulative effects collectively threaten the food security that is a hallmark of civilization. If food security cannot be restored quickly, social unrest and political instability will spread and the number of failing states will likely increase dramatically, threatening the very stability of civilization itself. This dire warning is in part based on the number of alarming food-related incidents that have occurred since September 2007, which have led Mr. Brown to further assert that, “Food riots are now becoming commonplace.” While it is not yet convincing to me these incidents are thus “commonplace,” Mr. Brown does give a reasonably well articulated perspective on the problem in terms of both increasing demand and decreasing supply. A summary of his view is given below. The recent sharp acceleration in the U.S toward the use of grain to produce ethanol for cars. There is little new farmable land available without clearing tropical rainforests, which has seriously negative impacts on the environment. New sources of irrigation water are even more scarce than new land. Agricultural productivity is increasing more slowly in recent years. Rising oil prices are increasing both production and transportation costs. Climate change is disrupting normal agricultural production. In systems thinking terms, Mr. Brown is asserting that there is a reinforcing loop that creates an increasing food shortage due to an indefinitely burgeoning population and constrained supply. However—while it is undeniable that we are currently in a global crisis precipitated by rising costs for food, energy, and core metals—this is an old argument that has suffered many withering criticisms. Thus, any argument for global economic collapse based on rising commodity prices and increasing population has got to address existing positions, some of which have been around since the 1700s. These positions introduce balancing loops to what seems to be a rapidly escalating reinforcing loop. 1. In a sharp rebuttal of the Malthusian assertion that increasing wealth inspires greater fertility, the evidence of history is that fertility in wealthier countries approaches near zero and can even become negative. (For example, Russia is facing population decline.) Data and estimates by the U.S. Census Bureau, shown in the graph, show that the global growth rate year over year is declining. 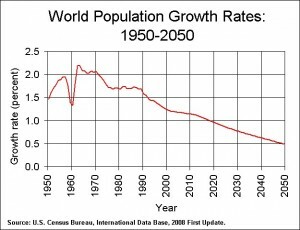 Ultimately, world population is expected to ultimately peak and perhaps even drop off a little by 2070. 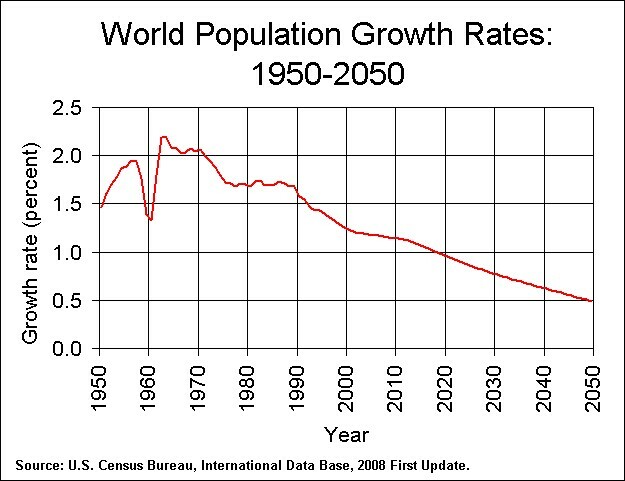 Thus, world population growth is eventually limited as societies reach higher stages of development. 2. As illustrated by Julian Simon’s victorious bet against Paul Erhlich, commodity prices tend to be brought back into line by the market. While there can be dislocation of prices for an extended period of time, and many people can suffer greatly during that time, there will ultimately be an adjustment of the prices downward. In fact, Simon claimed that eventually prices would be lower. 3. Moreover, while population growth is currently outstripping food supply, the Food and Agriculture Organization of the United Nations forecasts that food supply will be more the sufficient by 2030. This suggests that the gap between supply and demand is actually decreasing. 4. Finally, the recent sharp rise commodity prices may significantly related to monetary policy and global commodity speculation. The U.S. Dollar has been falling, and worries about the stock market are thought to have caused a flight of dollars into commodities, driving up the prices of oil and gold in particular. Speculative interest in these products is probably driving up the prices of other agricultural commodities. When other investment opportunities become more favorable again, there could be a dramatic flight out of those speculative positions. So, while food insecurity is a major problem that needs serious attention, it is stretching the facts to call it the harbinger of the end of civilization or a dire threat that requires the complete transformation of society. Catastrophe theories often assume that present conditions will continue on their current trajectory unabated, when in fact the self-organizing nature of modern society means that humanity is always reacting and adjusting to present conditions. That said, key organizations and citizens around the world need to take steps to manage the current dislocation of commodities prices. Market mechanisms will likely respond and help bring down the prices as people begin to find alternatives, explore other options, and find ways to improve production. Governmental policy changes and interventions may also be needed. But, in the macro sense, the problem is not likely to engulf the world, although it might threaten weaker governments. As the Foreign Policy blog Passport suggests, wealthier countries can probably weather the turmoil. It is weaker governments, such as those in the Middle East, that are the most at risk. The concern, then, is that those governments will falter, and there could be a subsequent ripple effect to the rest of the world, potentially creating a collapse of the global economy. In this dynamic complex world, where change is accelerating faster than the speed of light, it is unfortunate that your May 4th 2008 article lulls the reader into a sense of security … you extracted only a few sentences from the FAO 2002 article … don’t the hundreds of millions of poor people in developing countries mean anything to you? Your perspective ignores many other threats … for example, scientists have linked the exponential growth of environmental degradation (deforestation, toxic soil, soil erosion, drought, waste) to the collapse of great ancient civilizations (Roman, Greeks, Mayans, Aztecs, Easter Island, Norse of Iceland, Minoans) … all of which were regional. What seems like a problem that can be solved without resorting to zero population growth and a drastic change in lifestyles is an illusion … that it took 300 years to get near this tipping point is part of the illusion … the basic arithmetic of exponential growth is in effect, whether it’s a rapid rate or a slow rate. The metaphor of the lily pad that doubles every day for 30 days in a pond helps people visualize the problem of exponential growth in the wrong direction … on day 29, the pond is still only half full. Yet, “suddenly and unexpectedly”, on day 30, the pond is full. Doubling or tripling the size of the pond only buys the pond’s owner two or three days. Thus, while scientists cannot predict the exact day we are at in 2008, knowing that we are heading in the wrong direction ought to be enough to motivate leaders to change directions. Yet, most of today’s leaders are short-term thinkers, who have been seduced by the acquisition of power and prestige, just as the leaders of ancient civilizations … they have only to recall the P.B. Shelley’s “Ozymandias” … we ignore the rapid rate at which climate change is accelerating (rapid exponential growth) at our peril … we are much further in the curve than we were even last May … we stand on the edge of the tipping point of collapse … our waiting game is about to end. 6 November 2008, Rome – World cereal production is expected to hit a new record this year as high prices boosted plantings under generally favorable weather conditions, FAO said today in the latest issue of its “Food Outlook”, a bi-annual commodity publication. World cereal production is forecast to be large enough to meet anticipated utilization in the short-run, and help replenish much depleted global stocks. But the agency warned that the current financial crisis will affect agricultural sectors in many countries negatively, including those in the developing world. This year’s record cereal harvest and the recent fall in food prices should, therefore, not create a false sense of security, said Concepcion Calpe, one of the report’s main authors. “For example, if the current price volatility and liquidity conditions prevail in 2008/09, plantings and output could be affected to such an extent that a new price surge might take place in 2009/10, unleashing even more severe food crises than those experienced recently,” Calpe said. “The financial crisis of the last few months has amplified downward price movements, contributed to tighten credit markets, and introduced greater uncertainty about next year’s prospects, so that many producers are adopting very conservative planting decisions,” Calpe said. “There is a real risk that as a consequence of the current world economic problems people will have to reduce their food intake and the number of hungry could rise further,” Calpe said. @Paulina – After going back to your comment from time to time, I never really could quite understand it. But, let me say that my post has nothing to do with whether people are suffering or whether other factors might cause a collapse of society. Nor did I negate the need to work on the issues. I was only talking about whether food riots were an indicator of the impending end of society, which they are not. As now over a year and half has passed since then, and the spate of food riots has subsided, I think it is now obvious that I was right. While rising some in the last few years, the longer trend of food prices over the last 100 years has been downward in developed economies.